It's issues like New Avengers #61 that make me love comic books. From the writing of subtle scenes lacking physical movement to the action packed visuals drawn, colored, and inked to perfection, you will have a hard time finding a book this fun at the comic shop. In New Avengers #61, the Hood's super villain gang is given boosts of power to their various skills and abilities. With the enhancements, the Hood tells the group to seek out the outlaw Avengers (remember Civil War's Registration Act...that still matters) and kill or capture them. The duo of Captain America and...Captain America (Steve Rogers and Bucky Barnes) are attacked and engaged in battle as are the duo of Spider-Man and Spider-Woman. The Captain America battle is exceptionally entertaining because of the impact of Bucky's gun. He shows his unique Cap fighting style off by using a pistol to keep the Human Laser at bay. Guns have the stigma in comic books as being evil or inherently bad. The bad guy robbing the bank or mobsters always carry a gun; thus, a gun becomes a bad symbol. With the Barnes Captain America, Marvel is trying to push the fact that a gun (even a Luger...the most evil of all pistols since it was a primary German side arm during WWII) is simply an aggressive tool. Do not blame the tool blame the individual using it. In the hands of a Cap, it is used for good because it presses the morals and beliefs of justice. 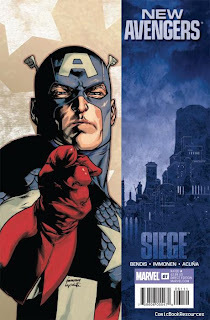 With that said, an interesting moment takes place in New Avengers #61 when Barnes is manipulated into turning the gun on his mentor and friend, Steve Rogers. The counter question then rises: Are guns in anyone's hands just too deadly and uncontrollable? The gun and shield are quite different symbols. One represents aggression and force, while the latter represents passiveness and defense/protection. I feel these style differences between the two Caps will lead to a story down the line about what ways are affective when dealing out justice and which ways are right. Do the ends justify the means kind of thing. Back to New Avengers #61...Brian M. Bendis writes a scene that steals the show: a truly amazing interaction between Spider-Woman and Spider-Man. The awkward jokes that Spider-Man makes irritate and confuse Spider-Woman to the readers delight. He relentlessly riddles her with comments as she is trying to be serious. When he asks her if they are on a date...classic! As I mentioned in the beginning, the visuals in this book are pitch perfect. Collaborating on the pencils for this book are Staurt Immonen and Daniel Acuña. Acuña handles the scenes between the Spider people and Immonen on the Caps. Both are perfect for their characters. I'm not positive as to whom inked this book, but I believe Daniel Acuña inked his conversation section with Spider-Man and Spider-Woman. I think it makes his art pop even when the characters are not moving. The bottom line is that this comic book made my week. It is the comic of the day for so many reasons, but mainly because Bendis has been given a lot of flack lately on his Avengers books. People say they are tiring of him and his style, too. Personally, I don't tire of what has been a very entertaining 60 issue New Avengers run. That's just me. I like good comic books. Okay...I did write that post on Quasar #17.